Milken California Policy Summit Asks: Will Innovative Financing Solve California's Housing Shortage? California cities, especially coastal cities, continue to struggle to meet market calls for more homeless, low and moderately priced housing to meet unmet demand. Lack of adequate financial incentives that support various types of development demanded throughout the state contribute to the supply crisis. 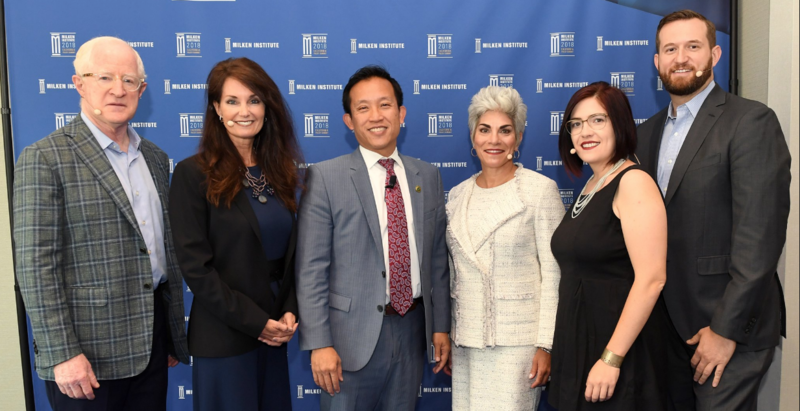 At the recent Milken California Policy Summit in the State Capitol, a stellar panel addressed what state leaders can do to incentivize more housing development at the local level and how available finance tools could be employed to expand the capital pool for affordable housing projects. Moderated by Beth Ruyak of Capital Public Radio, the panel included: Carla Boragno, Vice President, Genentech; Assemblymember David Chiu (pictured);Steve Hansen, Vice Mayor, City of Sacramento; Laura Foote Clark, Executive Director, YIMBY Action; and, Bill Witte, Chairman and CEO, Related California. TPR presents an excerpt of this Milken housing panel. David Chiu: Last year at this time, the legislature had not made the progress we wanted, in part because the stakeholders involved all wanted different things. I describe the politics of housing as a lot of folks pointing guns at each other. Cities want money from industry and oppose regulatory reform or any type of streamlining, whereas industry doesn’t want to have to pay and thinks there should be streamlining. Every time one idea would roll down the legislative process, it would be supported by one set of stakeholders and killed by another. What changed last year was that the magnitude of the crisis caused everyone to say, “We need all of the above solutions.” It’s about getting everything on the table and supporting multiple things. Beth Ruyak: Are housing and housing finance two separate problems? David Chiu: They are separate but related. One big challenge is that we have not had enough money to build the affordable housing we need. We need to think about traditional answers, like expanding the affordable housing tax credit and bringing back some version of redevelopment, but we also need to think innovatively. I’ve proposed that we think about the billions of dollars we are currently spending on the mortgage interest deduction—and whether that’s the best use of money, or whether we could use that money to build affordable housing. I’ve also proposed exempting property taxes for developers that build missing middle housing. We’ve got to think about finance, but we also have to think about barriers to creating housing more generally. We need to streamline the hurdles and hold cites accountable for building housing. Beth Ruyak: Mayor Hansen, is housing more of a political problem, or is innovative financing the solution? Steve Hansen: We have inflicted this problem on ourselves with bad policy—preventing the building multifamily through CEQA and other things that allow people to say no. But it’s also a financial problem, because we have challenges in this state around the cost of labor and materials. Sacramento and the Bay Area are part of the megaregion that drives our fundamentals when it comes to these costs. We need innovative financing. For example, with redevelopment, we had a predictable amount that we could bond out or dedicate. When redevelopment went away, cap and trade was pitched to us to fix that gap. But Sacramento can’t compete. We don’t get cap-and-trade money for affordable housing projects because the way the system is designed doesn’t allow us to score well enough. Now, the California Housing Finance Agency has come up with an innovative loan product for big multifamily home projects. Mixed use, mid-rise, multifamily, mixed income projects can be financed with an innovative solution like this that helps overcome the policy and political challenges that would otherwise price it out of the market. Beth Ruyak: There is no national strategy or policy on housing—and maybe there never can be. David Chiu: It’s clear that at this time there is no national strategy; in fact, it’s the opposite. HUD is cutting billions of dollars of resources to states like California. Tax policy changes are gutting our ability to use affordable housing tax credit tools. It’s a real problem. We are going to have to solve this ourselves, and it will take “all-of-the-above” solutions. Last year, the legislature had a major breakthrough with a package of bills that I see as an initial down payment on solving this problem. But down payments solve 20 percent of your problem. The number of units that we’re going to have to build in the coming years requires us to build at up to seven times the rate we’ve been building at. That means we’re going to have to do everything all at once, as well as try ideas that no one has yet done. Beth Ruyak: When the governor signed that housing package, the L.A. Times wrote, “The array of new laws signed Friday will hardly put a dent in the state’s housing problems. Developers need to build about 100,000 new homes each year beyond what’s already planned simply to keep pace with California’s population growth.” What do you think, Bill? Bill Witte: Related California is the state’s largest developer of mixed-income housing by a lot, and one of the largest developers of 100 percent affordable housing. We do innovative financing every day. But if it takes three years to get a project with no opposition approved, and costs go up 40 percent in those three years, you’re barely making a dent in the problem. The city of Seattle is very similar to San Francisco: progressive, tech-oriented, etc. It takes 15 months on average to get a project approved. In most of California’s urban areas, it takes three years if you are lucky. Until we move that needle, we’re not going to get there. Of course innovative financing matters, but until the process can be addressed in a meaningful way, the problem won’t be solved. Steve Hansen: I think the city of Sacramento can be an example of how to do this right. In 2013, we fought very hard to make housing a by-right entitlement for up to 78 units; we’ve now pushed that to 150 units. We’re working on implementing a bill, like the one Assemblymember Chiu has proposed, to allow for increased density within a quarter-mile of our transit stops. We’re doing all that largely with the public processes we have. But by being an assertive jurisdiction, we’re getting out of our own way. Pushing these decisions out of the hands of elected officials, in our case, has helped us get around some of the market forces that otherwise would have meant that we can’t build. I say to local officials: Move those decisions down and get out of the way from between the NIMBYs and the YIMBYs so things can happen. Beth Ruyak: Let’s turn to jobs and education and the alignment of the ecosystem of the economy. If you’re going to create jobs—whether it’s 750 aerospace PhDs or Amazon manufacturing jobs—people have to live where they’re going to work. Carla, there’s an important place for Genentech in this conversation; is your voice being listened to, and how do you make sure it’s at the table? Carla Boragno: At Genentech, we’re not in the business of building houses or driving policy around housing. We have a longstanding commitment to be a force for good in the community, and we’re seeing that we need to stand up and have our voices heard about housing. As one of the largest employers in the Bay Area, we understand that housing availability for all income levels is absolutely integral to sustaining a diverse and talented workforce, a robust economy, and a vibrant community. Our South San Francisco headquarters is a very large campus with office functions, commercial functions, R&D, and a large manufacturing complex. The ecosystem of people who support this operation goes beyond Genentech employees to service workers, folks that help run our utility operations, and more. Beth Ruyak: Assemblymember Chiu, of all the squeaky wheels you listen to, how squeaky is business? David Chiu: It’s somewhat squeaky, but it needs to be squeakier. The housing/jobs imbalance is a huge part of the crisis around the state. Those very industries that are fueling the economic success of California are exacerbating the housing crisis. We have seen five to six times as many jobs created in the Bay Area in recent years as we have had housing permits. We need to think about creative solutions. Cities that are happy to welcome jobs but not build housing need to be appropriately incented or disincented. In the Bay Area, Cupertino is happy to bring 12,000 new Apple jobs, but their mayor says, “We don’t have a housing problem.” Brisbane is ready to build thousands of new jobs, but says, “Our workers can live in Oakland, San Jose, or San Francisco.” We’ve got to think differently about how we can incent cities to do the right thing. If you want the job creation, that’s great—but you’ve got to commit to building the housing. We also need to think about transit-oriented development. At this moment, there are 300 acres of surface parking lots around BART stations in the Bay Area. We have local officials who want to control how [TOD] happens. Well, they’ve had 45 years of BART’s existence to control how that happens, and instead, we got surface parking lots. We need to think differently about building housing next to jobs and next to transit in a way that’s smart and that allows us to be a 21st century growth area. Beth Ruyak: Assemblymember, going forward, where’s your emphasis for introducing legislation. How much of what you want to accomplish is related to finance? David Chiu: We have a pretty robust housing agenda, and certainly as this legislative session ends and a new governor comes in, we’re going to have to do even more. Some of the answers have to be around financing, like a significant expansion of the Low-Income Housing Tax Credit. I think we have to bring back Redevelopment 2.0. Tax-increment financing worked, particularly when it came to housing and infrastructure. As I mentioned, I also think we should exempt property taxes for folks trying to build housing that we’re not building at this time—for firefighters, nurses, retail workers, and middle-class families that are being pushed out of expensive areas. But that’s just the financing side of the problem. We’ve got to tackle streamlining better, holding cites more accountable, and calling out the inconsistencies when neighbors oppose projects and say, “We care about homelessness and housing, but not in my backyard.” That has to change. If we are serious about producing 3.5 million units of housing over the next eight years—as Democratic gubernatorial nominee Gavin Newsom has committed to—all of us are going to have to think differently. We’re all going to have to get out of our comfort zones and do new things. Beth Ruyak: How much might this housing conversation change under a new Governor and administration? David Chiu: I have great hope for a new administration. In fact, Gavin Newsom, the candidate I’m supporting, would be the first governor to commit to a significant increase in the amount of housing that we build. He has put out a lot of different ideas about how to do it, and I think we’re going to need all of them and more. I’m looking forward to working with this administration and the business community as well as a diversity of communities. Beth Ruyak: How can legislators and developers work together to accomplish what you’re both fighting for? Have you had reason and opportunity to work together? Bill Witte: I’ve been doing this a long time, in both the public and private sector, and I’ve never seen the attention given to housing that I’ve seen in the last couple years. There has also never been a YIMBY group. Groups like YIMBY and their affiliate Housing Action Council of San Francisco have been crucial in focusing attention on this issue at the macro level. But at the micro level, sometimes I’m left thinking, “Let us handle this. Don’t come to the planning commission.” We’ve already negotiated with the neighborhoods, and we don’t want to get into that. Still, if they didn’t do the macro work, we wouldn’t even have the chance. Finally, money matters in Sacramento—pictures of dead presidents. They are fundraising, and it can make a difference. Don’t underestimate that. Laura Foote Clark: One of the forgotten pieces in this puzzle is the role that construction plays. We have not seen innovation in the construction industry to house more people quicker. We need to make sure that people have access to housing and increasing the speed of construction. One of the ways that the Legislature can address this opportunity is through reforming Proposition 13. We have an entire generation of housing advocates stepping up and making there voice heard. Steve Hansen: Project-by-project activism and advocacy is really draining the energy from the YIMBY movement. Largely, it is seen by people who are against projects as benefiting developers at the expense of communities. But until we get policy reform, we have to fight project by project. Change is happening. Senator Scott Wiener, Assemblymembers Chiu and Ting, and others, have been working to move this conversation beyond nibbling around the edges of policy reform. Certainly, we do need more ADUs and other things to be streamlined, and it was good that SB 35 and the housing package allowed people to skip local entitlement or bypass CEQA if they met certain requirements. But ultimately, unless we reform the way we look at housing creation and finance, we’re screwed. The housing crisis is a lot like the healthcare crisis. We saw premiums go up like rents are going up. We saw limited access, the system struggling, and people going bankrupt trying to provide for themselves. We need an Affordable Housing Act, like the Affordable Care Act, to fix this problem. But the federal government keeps doing nothing and in fact creating harm. But California, with Governor Newsom, could grab this issue and do something. It’s going to be entitlement reform and CEQA reform. It’s going to put checks on local government that just say no. And it’s going to undo some of our legacy around racism that made multifamily units unwelcome in many communities because they brought in people with lower incomes and people of color.